Once again the Heroes Hat is remaining in Hamden for another season. 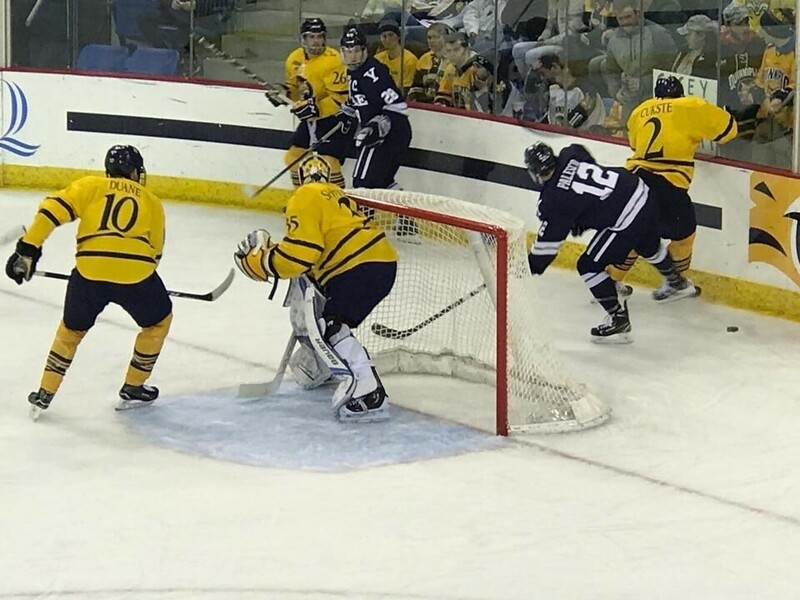 The Quinnipiac Bobcats made sure that happened with a strong defensive effort along with some timely goals to shutout the Yale Bulldogs 3-0 Saturday night at the Frank Perrotti Jr. Arena. It was a return to what Quinnipiac does well with strong defensive hockey and excellent goal-tending that help lead to a weekend sweep after back to back weekends of being swept themselves. Quinnipiac is now 9-0-1 against the Yale Bulldogs since losing the 2013 National Championship game to them in Pittsburgh. Early on this game a defensive struggle with a lot of physical play between the two schools separated by less than 8 miles. Both teams also got strong goaltending from both Quinnipiac's Andrew Shortridge and Yale's Sam Tucker. Quinnipiac had multiple opportunities in the opening period to get on the scoreboard for multiple goals but Tucker was brick wall bringing memories back of the performance that Yale goaltender Jeff Malcolm had back in the 2013 National Championship game. The best chance in the opening frame for Quinnipiac came on a Tanner MacMaster penalty shot but he was denied by Tucker. Quinnipiac opened the scoring 2:22 into the second period when Chase Priskie fed Brogan Rafferty at the point where his bomb made it through traffic and a screened Sam Tucker for the goal. The Bobcats continued to pound Tucker in the second putting 19 shots on goal. With a power play that has been improving, Quinnipiac had six power play opportunities through two periods but didn't convert a single one. 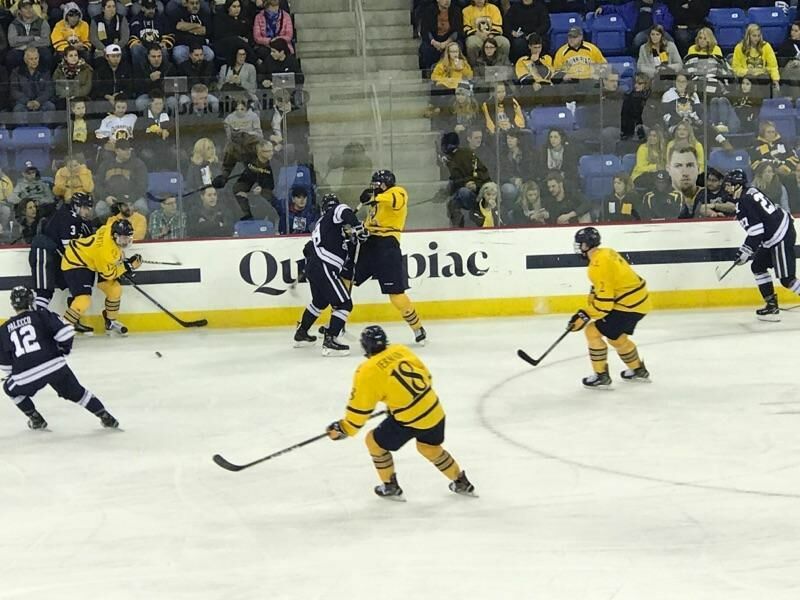 Quinnipiac's defining moment of the game wasn't any goal but the 5 minute major penalty that they killed off when Tanner MacMaster took a slew footing penalty and was ejected from the game. It was an impressive stand as prior to the 5 minute penalty Quinnipiac had killed off two consecutive Yale power plays making the Bobcats having to kill off almost half the period via the penalty kill without even having to use their timeout. With momentum shifting back to Quinnipiac they scored an insurance goal on a redirect goal by Craig Martin off Kevin McKernan's initial shot at almost the 15 minute mark of the third period. Freshman Devin Moore picked up his first collegiate point with a secondary assist on the goal. Not even a minute later Quinnipiac put the game on ice when Thomas Aldworth blew past a Yale defenseman finishing cleanly past Tucker for his first goal of the season officially making sure the Heroes Hat remained in Hamden for another season. Andrew Shortridge continued with his strong play with 30 saves for his second consecutive shutout and third of his career. The teams combined for 16 penalties in a very chippy game. Quinnipiac now heads into the Thanksgiving holiday on a positive note winning two straight conference games to improve to 5-5-1 overall (2-4 ECAC). The Bobcats next play UMass Amhert in a home and home series next Friday and Saturday night with the first leg of the series in Hamden followed by a short I-91 trip up to Amherst the next night.